Pharaoh Ay is known in popular books as the person who may have murdered Tutankhamun. Usually, he is described as a pharaoh-monster of the 18th dynasty. However, the real history is very different. Ay appears in it as one of the most important men of his times. When Tutankhamun died, Ay was about 70 years old, or possibly even older. He had a lot of experience as an advisor of the pharaohs and he was a leader. The reign of Ay started unofficially during the lifetime of Tutankhamun, but his first journey to the throne started when he became vizier of Akhenaten. He was the best prepared to rule Egypt at the time and perhaps related to the royal family. Ay is believed to have been a native Egyptian who was born in Akhim as a son of Yuya and Tuya. Yuya served as a member of the priesthood of Min in Akhim. His name was not a common one in Egypt, which may suggest that he could have come from Syria, but this is uncertain. With his wife Tuya (Tjuyu), he also had a daughter – the future Queen Tiye, mother of Akhenaten. 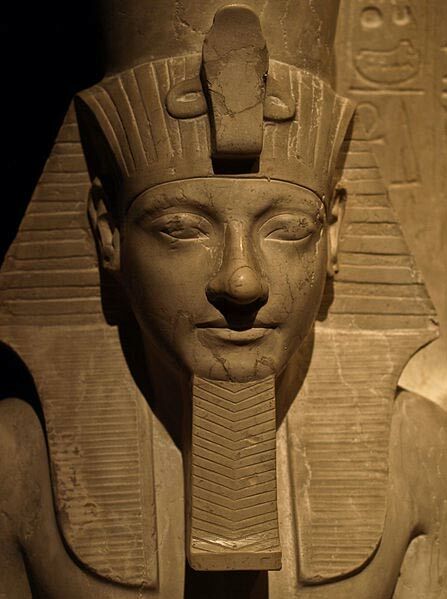 Yuya became a very influential person in the royal court of Amenhotep III, but also his ancestor Thutmose IV. Yuya was such an important person, that he received the rare privilege of having a tomb in a Royal Valley of the Kings. According to an inscription in the Theban Tomb of Ay (WV23) he was also the father of the famous Queen Nefertiti and Mutnodjmet, the future wife of pharaoh Horemheb. The family of Ay were the main characters of the Amarna Period and the last decades of the 18th dynasty. Ay ruled Egypt 1325 and 1321 BC. He had two main wives, Iuy and Tey. After the death of Tutankhamun, Ay married the widow Ankhesenamun. She was also perhaps his granddaughter. According to Hittite archives, Ankhesenamun wrote a very painful letter to the king of the Hittites, Suppiluliuma I. She asked him to give her one of his sons to marry her and become a pharaoh. Ankhesenamun said she didn't want to be Ay’s wife. Suppiluliuma I was suspicious at first, but after some investigation and confirming that the letter was authentic, he decided to send his son Zannanza to Egypt. Unfortunately, the young prince was killed during his travel through Syria. It is very likely that he was murdered by Egyptians. Thus, Ankhesenamun married with the elderly Ay. If he didn’t marry her, she would have joined the harem of widows, lonely women, unmarried women, and other unlucky women of pharaohs. Life in the harem wasn't good enough for a girl with royal roots. Ankhesenamun would perhaps not survive too long in the rigor of working in the harem. One may suppose that Ay married this young woman to support her and give her a better life than most of the widows had in ancient Egypt. The name Ay (it-netjer) means "Father of God'', but in fact he was perhaps a father of a goddess. If Ay was really the father of Nefertiti, he did his best to make her the most powerful woman of her time. The source of power of Nefertiti remains a mystery. 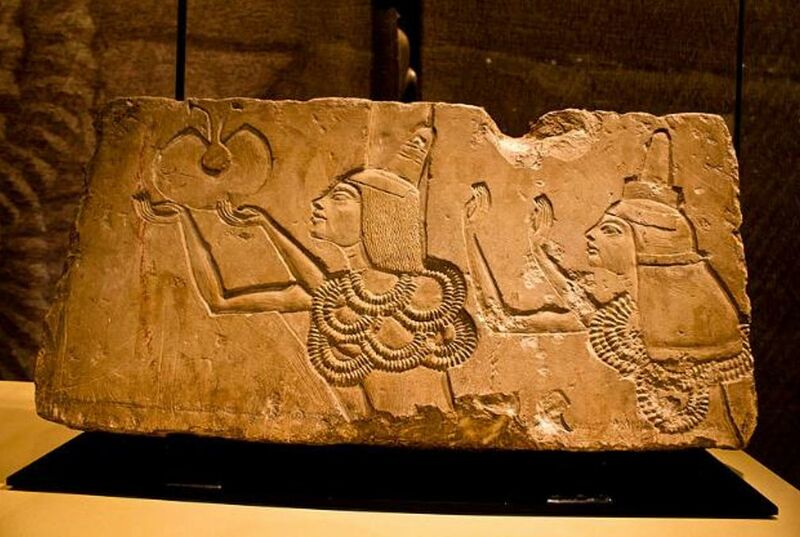 Evidence shows that Ay was much respected in the court of her husband – Akhenaten. He assigned Ay many jobs such as ''Acting Scribe of the King'', ''Fan Bearer on the Right of the King'', ''Master of All the Horses of His Majesty'', etc. Like his parents, Ay received permission from the pharaoh to construct his tomb in the royal necropolis. After the death of Akhenaten, Ay returned to Thebes. He wasn't interested in following the faith in Aten, like his daughter and son-in-law did in their city – Amarna. Was Nefertiti still alive? There are many theories about it. It is known that Ay took care of the reign of Semenkhkare and Tutankhamun. Waiting for his chance to become a pharaoh, he was a loyal vizier and wise adviser. Horemheb married the second known daughter of Ay – Mutnodjmet. During the first phase of the collaboration between Ay and Horemheb, they seemed to get along well. However, with time they became rivals. Horemheb was a warrior, a solider. Previously, he didn't have political ambitions, but due to his royal marriage and rising position, he started to dream about becoming the pharaoh after the death of Tutankhamun. The young pharaoh was a child full of illnesses, so it was likely that he would not live for too long. Some records say that the relationship between Horemheb and Ay was broken after Ay sent his son-in-law out of the capital city, far away from the great politics, and used this time to arrange his coronation for pharaoh. After the death of Ay, Horemheb became the pharaoh. During his reign, he tried to remove all the inscriptions which linked him with Amarna. He didn't want to be connected with the old world he came from. He perhaps hoped to create a new royal family, which would rule Egypt for centuries, but it didn't happen. Where is the Mummy of Ay? The first tomb of Ay was constructed in Tell-el-Amarna, a great city of Akhenaten. It contains the longest version of the famous Hymn to the Aten. After the end of his dream about living in the beautiful city of the ''heretic king'', Ay started to create his tomb in the West Valley of the Kings. The tomb looks very similar to the tomb of Tutankhamun, which suggests that it was made by the same artists. The tomb was looted in ancient times. Similar to the tomb of Tutankhamun, only the burial chamber has depictions upon it. The sarcophagus was displayed in the Egyptian Museum in Cairo for some time, but currently it is located back in the tomb. However, the mummy of Ay has never been recovered. Some researchers believe that he may be Man C from the DB320 cache. Others say that he can already be located in the Cairo Museum, but as an unwrapped or unidentified mummy. Older research suggested that Horemheb could have destroyed the mummy to be sure that Ay didn't get into the Afterlife, but that doesn't seem to be likely. The discovery of the mummy could answer many questions about his life, death, diet, diseases, and age. For now, the great pharaoh Ay remains one of the many mysteries of ancient Egypt. I personally believe that Ay was a convenient villain to blame for Tutankhamen's death. Looking at all the inbreeding that was going on in Egyptian royal families, it is the more likely and logical explanation for the young king's early demise. "Horemheb" didn't marry Nefertiti's sister Mudnojmet: Setau did, king of Kush! All Maya: Illusion! "Akhenaton" is the Akha Nathan...the "Aten" and you can see Yuya is wearing a MASK as "Akhenaton" while the real one, Surya/David was banished to S.E. Asia! FACT! Tiye below is the mother of Akhenaton...the real one: Surya the Dwarf aka Nebuchanezzar! Even pictured wearing "David's Harp" on his jacket...the Dvavrati era of S.E. Asia!